The Digital Research Library of Illinois History Journal™: The Story of the "American Bottom" in Illinois. The American Bottom region is comprised of the four counties in the St. Louis Metro East of: Madison Co., St. Clair Co, Monroe Co, and Randolph Co. It runs along the eastern shore of the Mississippi River from Alton, IL to Kaskaskia, IL. In 1849 the American Bottom was mostly rural with a few good size towns; Alton, East Saint Louis, Belleville, Cahokia. Click for a full size map. The name American Bottom had its origin about a century ago, at the time Illinois came under United States jurisdiction, and from the following circumstance: the west side of the river being known as Louisiana, or New Spain, while on the east, in the river bottom, was called America; hence American Bottom, which it continues to bear that name. 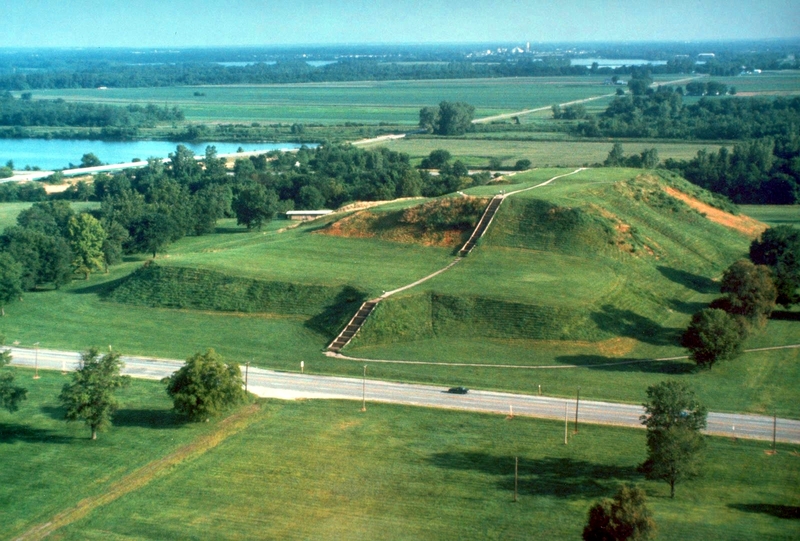 Human settlement of the American Bottom region goes back to ancient Native Americans and their settlement in Cahokia. Europeans beginning with the Spaniard, Hernando de Soto first traveled through the region in the sixteenth century. This European contact was transitory and it was not until the seventeenth century that the French explored the region with the intention of settlement. French Cahokia, founded in 1699, was not the first French outpost, but it was the earliest settlement that survived more than a few years. Kaskaskia was the next place French settlers built, and it was followed by a series of east bank towns at Prairie du Pont, Fort Vincennes and Fort de Chartres on the Mississippi River. 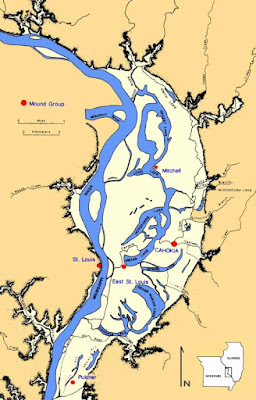 Settlements by the French on the west bank of the Mississippi included New Madrid (then known as Ainse de la Graise or "Greasy Bend") and St. Genevieve. These were followed by St. Louis, St. Charles, Carondelet in 1767, St. Ferdinand (now Florissant) and Portage des Sioux. Settlement increased after the late eighteenth century and the end of the American Revolution. On the Illinois side of the Mississippi River. This tract of land consists of timber and prairie about equally divided, and much of it subject to inundation, but for fertility of soil it was unequaled in the western part of the country. During the French occupation of Illinois the only permanent settlement (except for Peoria) was made on this bottom, and there is where the descendants of these early pioneers continued to live. The old towns on this bottom still remain French in language, customs and habits, and the people had little to do with those speaking the English language. As settlers reached the American Bottom there were those who established homes within the Mississippi River's flood plain, on the eastern shore. At the time, the area was swampy and prone to flooding. Most settlers preferred the higher and better draining Missouri side of the river. We know the identity of only a few of the first Illinois settlers. The historical record begins in detail with the forceful presence of a single man, James Piggott, who, while instrumental to the region's development, certainly benefited from the help of his family and the other settlers of the area. James Piggott took the long view regarding the development of Illinois territory. Born in Connecticut, his fortunes took him further west throughout his life. He served in the Revolutionary War as a member of the Eighth Pennsylvania Regiment. After his military service he joined George Rogers Clark recruiting families to live in the proposed town of Clarksville, close to present day Wickliffe, Kentucky. Chickasaw Indians forced the abandonment of this endeavor in 1782. Piggott moved with seventeen other families to where Columbia is today. Illinois Territorial Governor, Arthur St. Clair, made Piggott a Territorial Judge in 1790. In 1792, Piggott and family settled in Cahokia. He laid a planked road from Cahokia to a low point on Cahokia Creek (at what would later become Illinoistown then East St. Louis), then built a 150-foot wooden bridge over the creek so goods could get to his ferry. During that time, that area was swampy and uninhabited. So... to get to St. Louis from the Illinois side, you'd have to start from Cahokia and go North, up the Mississippi, against the current, to get to St. Louis. Fort Piggott, or as it was sometimes called; Fort Big Run. It was Piggott’s idea to change the name of the town to “Big Run.” James Piggott erected this fort in 1783 at the foot of the bluff, one and one half miles west of Columbia. The fort was located on what was known as Carr Creek, which the French called "Grand Risseau" (literal translation: large gully). The creek was named for Lenard Carr, an early settler. Fort Piggott was located on the old Charles Schneider place, now the residence Elmer Schlemmer, et al, in survey 554 Claim 487, Monroe County, Illinois, and adjacent to present in City limits of Columbia. 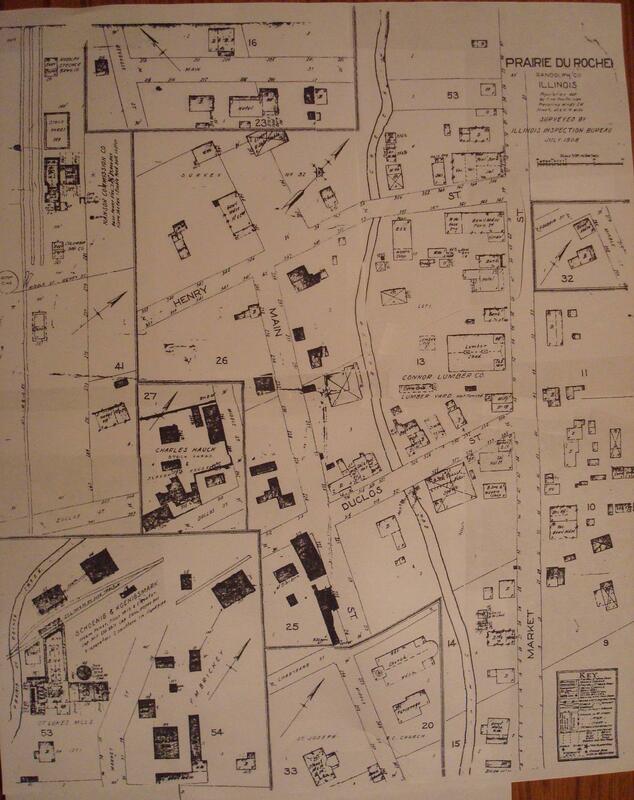 Fort Whiteside or Whiteside Station was located on the Robert J. Frierdich place and east of the Shoemaker School, in survey 412 Claim 520, formerly owned by Francis Joseph Frierdich, now by Robert J Frierdich. These locations were in the American Papers in the Court House at Waterloo, Illinois and the information was supplied by Robert Gardner, County Surveyor and Arthur H. Rueek, Circuit Clerk. James Piggott the builder of the fort was a soldier. He fought with Washington in the Battle of the Brandywine and with Gates at Saratoga. As Indian depredations increased the Fort became a haven for the settlers. When word went out to summon the settlers for safety's sake to the fort it was said that even the children realized the danger and would go silently to the fort without a word of caution from their elders. Indian massacres were accelerated and during 1789 and 1790 no one was safe. Indeed, one-tenth of the population was massacred by the Indians. The growth of St. Louis encouraged the development of the Illinois side of the Mississippi River. With the demand to ferry to St. Louis increased. Piggott's Ferry became a central point for travelers. The ferry transports people, animals, carts, wagons, and goods to the St. Louis docks quickly. The area around the dock developed very quickly. Piggott faced competition from other entrepreneurs interested in capturing some of the ferry business. After James Piggott died in 1799, the ferry continued operation by his sons. The McKnight-Brady operation invested in Piggott's ferry. Eventually was sold to the Wiggins Ferry monopoly. They platted the land behind the Piggott ferry in 1818 and called it Illinoistown. When James Piggott established his ferry service in 1795, the closest settlement on the Illinois bank was south of the ferry in Cahokia. Piggott's ferry landing was still little more than an outpost in the wilderness. 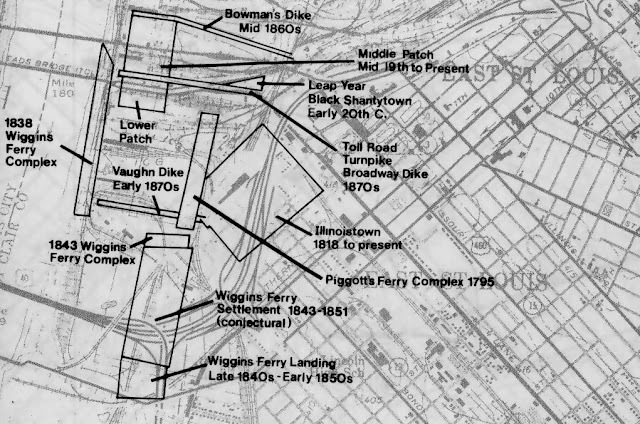 However, Piggott was soon transporting both people and goods to St. Louis and the ferry landing was a natural place for commerce to develop. Between 1805 and 1809 a wealthy French Canadian, Etienne Pinsoneau, purchased land behind the ferry landing and built a two-story brick tavern. He called the area Jacksonville. In subsequent years Pinsoneau sold some of the land and in 1815 Moses Scott built a general store. The McKnight-Brady operation bought out Pinsoneau at the same time it invested in Piggott's ferry. Brady and McKnight platted the land behind the Piggott ferry in 1818 and called it Illinoistown. A traveler in 1821 reported that Illinoistown was located about 400 yards from the Mississippi River on the east side of Cahokia Creek, and that it consisted of 20 or 30 houses and 100 inhabitants. Illinoistown was described in 1837 by the Reverend John Mason Peck as a small village of about a dozen families. The town was said to contain a hotel, livery stable, store and post office. Wiggins Ferry was the official name of the post office and Samuel Wiggins, a politician and Illinois businessman, was the postmaster. Although a flood in 1826 (only one of many to damage the area) may have set back the growth of Illinoistown, Wiggins' concentrated ferry business helped spawn economic growth throughout the 1820s and 1830s. By 1841 Illinoistown had grown into a "lively commercial river town" with "125 houses, an iron store, one distillery, two stores of general merchandise, five groceries, two town bakeries, one saddlery, one shoemaker, two blacksmith shops, one coopers shop, one tailor, and two taverns or hotels besides a variety of other subsisting businesses. Also a recently-established printing office issued a weekly newspaper, the "American Bottom Reporter", printed by Vital, Jarrott & Company. Gustav Koerner in his memoirs has said that this was an Indian (Native American) paper, published in 1841-42. This was the same paperas the "American Bottom Gazette" of East St. Louis, of which the American Bottom Reporter was the earlier name. The phenomenal growth of both residential and commercial settlement in Illinoistown during this four year period, is, if we can accept the accounts as accurate, an indication of the growing importance of the east side of the river and economic maturation. The apparent decline between 1823 and 1837 was probably a result of the devastating flood of 1826 and loss of population to more suitable locations. In addition, the town was probably very much directly influenced by economic fluctuations on a larger scale. The biggest changes in domestic trade were brought about by the steamboat in the 1820s and canals in the 30s and 40s. The effects of these developments in transportation were to decrease the costs of products coming into the west from the east while increasing the marketability of commercial goods in the west by providing cheaper transportation to the east. The drastic change in the fortunes of Illinoistown seems to be a reflection of the change from primarily a supplier to St. Louis to a lively commercial town in its own right. 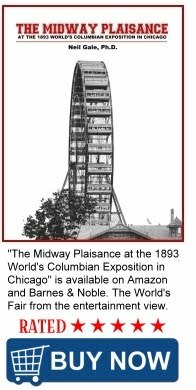 The first thirty years of the nineteenth century marked a period of regular growth along either side of the Mississippi. St. Louis was established as the largest city in the region and a central starting point for people heading west. The community on the Illinois side was growing as well, providing passage to St. Louis. Steamboats brought Illinoistown and St. Louis a variety of new ventures. Steamboats needed fueling stations and a means of transporting their goods once ashore. The local ferry operations were a natural fit, developing shore facilities for steamboats and already possessing the ability to quickly move goods across the river at low cost. By 1828 the Wiggins operation had converted its ferries to steam, taking advantage of its renovated facilities and the fairly low cost of constructing a steamboat. The old French village of Prairie du Rocher is located at the foot of the bluff, three miles from the Mississippi River, and in the northwest corner of Randolph County. There is a rocky cliff, thirty miles long and about two hundred feet high, bounding a fertile bottom, which gives to the place a romantic and picturesque appearance. Its secluded situation, fine scenery, rich soil and large spring of gushing water attracted the attention of early pioneers, and caused it to become a place of importance. Village map of Prairie du Rocher, Illinois. A short distance above the town, at the base of a rocky cliff, is a large spring, sending forth and immense volume of water, whose crystal purity might have been taken for the fountain of life, which gave immortality to youth and vigor, so much sought after by the early Spanish explorers. Near this spring is a remarkable cave in the high rocky cliff, but it has never been explored to any great extent, as its chambers are filled with foul air, which is thought to be destructive to life. According to Jesuit history Prairie du Rocher was incorporated into a village in the year 1722, and a large tract of land granted to its citizens, with an additional tract bounding the Mississippi River for a number of miles for school purposes. The old Jesuit chapel of St. Joseph, built in 1734, is still standing, and is probably the oldest building on the American Bottom. Within its portals have been christened the infants of many generations, and the marriage vows of the people of Prairie du Rocher have been heard at its sacred alter for almost three centuries. The register of the chapel, commencing in 1734, containing a record of births, marriages, deaths, etc., was taken to Kaskaskia in 1855 for the purpose of being copied, and unfortunately, some of the records were lost. When René-Robert Cavelier, Sieur de La Salle (or: René-Robert de La Salle) and his comrades returned from an excursion to the mouth of the Mississippi River in the summer of 1682 they stopped some days at Cahokia, which at that time was a large Indian village. Two Jesuit priests, Pinet and Garvier, who accompanied the expedition, remained here for the purpose of converting the natives. These priests built a chapel in the midst of the village, dedicating it to St. Peter, and named the mission Notre Dames Cahokia. In the following year La Salle authorized Richard Bosley to establish a trading-post here, and with the traders came many emigrants from Canada, forming the first permanent settlement in the Mississippi Valley. Monks Mound at Cahokia, Illinois. The emigrants built houses in the town with the Indians, and for more than a century they lived together in peace and harmony as one people. Marriage between the French and Indians being legalized by the Catholic Church many of the fur traders and early explorers of the west found wives among the blooming daughters of Illinois. Some of the present inhabitants of Cahokia can trace their genealogy back to the time of La Salle, and, their ancestors having intermarried with natives show strong marks of Indian lineage. The location of Cahokia is unfavorable for commerce, being situated on Cahokia Creek, a mile and a half from the Mississippi, but still not out of reach of its floods. In early times the water in the creek was sufficient to float their small crafts, but a Frenchman in seeking revenge cut a channel from the creek into the river, three miles above the town, leaving it without water communication except in time of floods. Along Cahokia Creek are a number of small lakes, and no less than sixty-seven mounds of various sizes and shapes. Cahokia at the present time is only a small town, the houses standing here and there among gardens and shade trees, the inhabitants mostly engaged in farming, and but few of them can speak or understand English. The marker is located in Randolph County on the east side of Route 3, 3.5 miles north of Ellis Grove and approximately 18 miles above Chester at a turn-out area. The marker was erected on July 28, 1965 by Illinois Department of Transportation and The Illinois State Historical Society. The Marker Reads: A more congenial soil for general cultivation I believe no where exists, it may be called the Elysium of America.' That is how a settler in 1817 described the American Bottom, the lowland between the Mississippi River and the bluffs to the east which stretches from the Wood River to the Kaskaskia. Hundreds of years ago an agricultural people settled in this silt-filled channel of an ancient river and raised crops to feed their large cities. Today many mounds in the area stand as monuments to this early civilization. 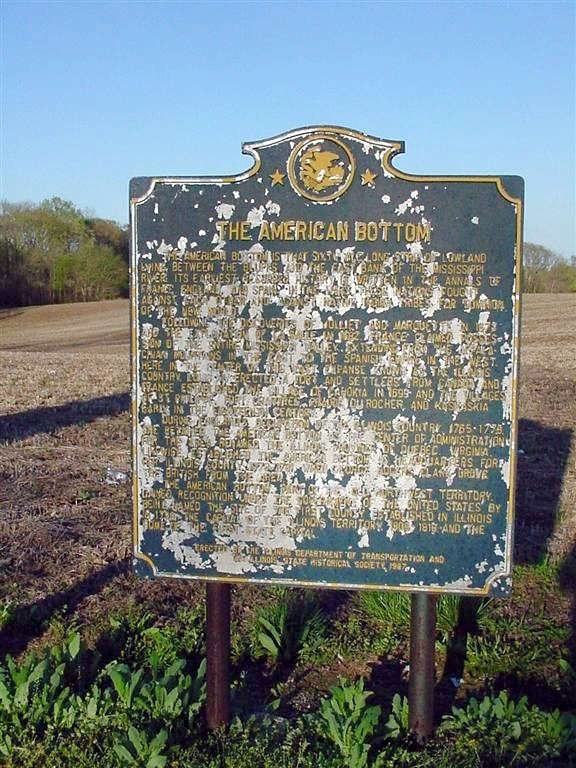 The American Bottom served as the center of settlement for the French, the British and finally the Americans in Illinois for over a hundred years. At the height of French activity after 1700 probably no more than 2,000 Frenchmen and Negroes lived in the region but they produced the grain for posts on the Ohio and lower Mississippi, explored the surrounding territory for mineral wealth and established Fort de Chartres. The British took the land form the French in 1763 but their interest in the American Bottom was slight. When Goerge Rogers Clark led his small army to the area in 1778 he captured Kaskaskia and the other villages without striking a blow. Under the Americans, Kaskaskia became the territorial and the first state capitol. Very interesting in depth story of the area's history.